- The kit does not include a regulator. 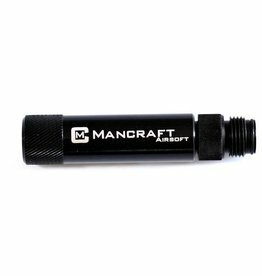 Mancraft CO2 Adaptor allows you to use 12g CO2 capsules with your HPA set up. This adapter is designed to work with Mancraft regulators. However, it can operate very well with other brands of regulator. Allows adjustment and regulation of pressure supplied from bottle to gun. This compact lightweight HPA tank is great for keeping your loadout tight and manoeuvrable. Skid for SDiK VSR 45°, for better work & performance (SDiK will not rub on the cylinder).